Great news! While I was attending the ESRD Network annual meeting, I chanced to meet a VP of a chair manufacturer and we got talking. I tried out the chair he had on display and we started generating ideas for the next generation of chairs. After about a half hour, he suggested I should visit their plant and, talk with the engineers. I happily accepted his offer and told him I’d make myself available. It would be nice to have a dialysis chair designed with patient input, wouldn’t it? I really appreciated his interest in my perspective on the dialysis chair. I will keep you posted on this as it develops. I’ll let you know more (like the VP and the company) when I hear about specific plans being discussed and made. I don’t want to mention names until the plan is more fully developed. But I’m excited to have some input into something I spend so much time with! This entry was posted in dialysis, dialysis chair, dialysis equipment and tagged chair, dialysis, hemodialysis, kidney, treatment. Bookmark the permalink. Devon, this is @melodybliss 🙂 Anyway, about the chair (Lumex 566G) and why we hate it so much. I sent you a tweet to you show you the old chair that we’ve used for over four years. That chair (the old one) is nice and oversized, very well cushioned, has an integrated pillow which can be removed IF you don’t like it or have your own. It’s side arms fold away when not used and when it is used, they are at the SAME height as the arms so they effectively extend the arms and give you a nice stable platform for things. And they have their own cup hole so if you bring a cup for water or other liquids you don’t have to worry about it being knocked over/off by a tech or nurse who’s leaning over you to check vitals. The new chair (the Lumex) is none of these things. The padding is very light so it feels like you’re sitting on a hard board. There is no integrated pillow so you have to bring your own (and we already have to bring enough stuff). The side boards are below the arm rests so you either have to rest things on the arm rest (which are VERY narrow so that doesn’t work well) or on the board (which is ALSO narrow and short) or on both and risk things sliding (I’ve already had things drop multiple times due to sliding). Since the boards are plastic they have no grip. Trying to grab my iPad one handed, for example, is impossible off of the board if it’s flat — it keeps on sliding around. The arm rests, because they’re so narrow, feel like they give no support during the stick. My arm hangs partially off the front. Really nerve wracking during the stick since you know how huge those needles are. The chair itself is pretty narrow. 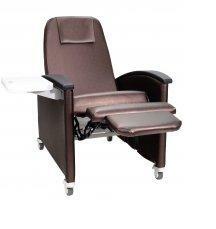 Supposedly they have the wider model available but the clinic only has 7 of these and we’re a 40 (or so) chair unit. Not even close for everyone. Even the really tiny people complain that the chairs are too narrow. The chairs also have very little depth. I feel like I’m sitting on the edge when I’m fully upright. I’ve mentioned the old chairs have a drink hole to securely hold water bottles and such. The new one doesn’t. Luckily my coffee mug is fully sealable but I’ve already had my mug knocked over three or four times since we got these new chairs. Others aren’t so lucky. There have been messes. But yeah, this chair stinks IMO, especially compared to the old one. The fact the old one existed means that they CAN created a comfortable chair that’s useable. But I think companies are just trying to be cheap. Thank you for that! Valuable information! Hello Devon, we are expanding our dialysis clinic and would like more info on the chair you tested. We would like to consider that make / model if you liked it. Thank you.